Benjamin Franklin once said, “Tell me and I forget, teach me and I may remember, involve me and I learn.” The AV systems that are being used in schools today are doing more than just telling the students what they need to know. It has taken the next step and is now involving them by encouraging them to engage and collaborate—leading to greater retention of information. This is even true of digital signage in educational settings, which is now going beyond simply showcasing menus and weekly events. Let’s look at some of the ways schools are using digital signage to enhance the learning experience. Today’s digital signage features both interactive touchscreen displays, as well as large screens for projecting digital content. Some can even sync with individual student devices, allowing for screen sharing at a large level. Others sit in strategic locations around the classroom or school and encourage students to interact with the devices and each other in small groups—creating even more meaningful educational opportunities. In post-secondary education, displays can help bring the complexities of genomic sequencing to life, enable grad students to collaborate with like-minded peers half a world away, and give students access to multiple subject points of view at the touch of a button. Humans are naturally visual creatures. Most people process visual cues more quickly than while reading and comprehending words on a page. Access to videos, infographics, interactive three-dimensional models, and games create new learning connections that students of any age can use to absorb and retain information. 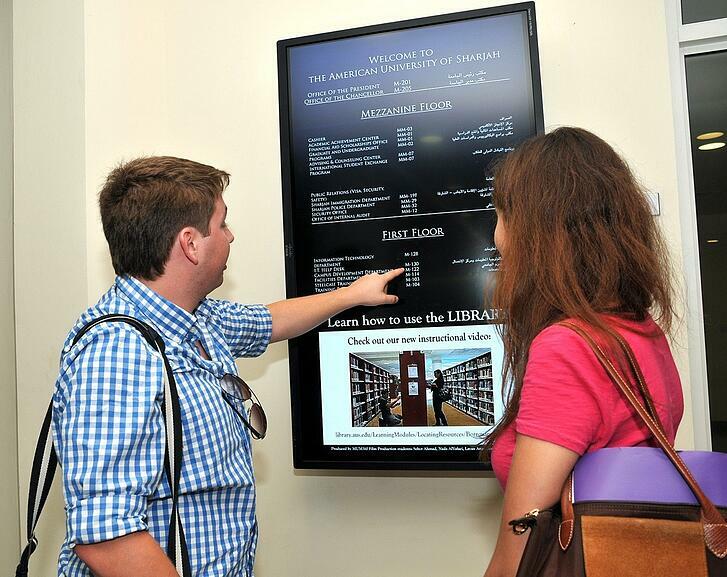 A tech school in Iowa uses digital signs to help students navigate campus, and Boston University gives students control of some of the digital displays to help empower student voices. Many colleges use interconnected displays to alert students to emergency situations, and at a rapid pace, digital displays are playing a role in education both inside and outside of the classroom. Collaboration made easy. Students, educators, and real-world professionals can all tap into the power of digital signage for group interactions, interviews, presentations, and projects. Engagement. Visual cues and the diverse functionality of digital signage often hold student attention better than textbooks and lectures. Environmental sustainability. The use of digital signage and individual devices reduces or eliminates the need for paper copies in the classroom. Recognition. Educators can use displays to recognize students for their hard work, kindness, and other acts of excellence. Recognition plays a role in student productivity and satisfaction. Control. Administrators hold control over the technology to improve classroom control and focus during use. They can also relinquish control to students to encourage creativity and foster empowerment and self-confidence. Cost-efficiency. Digital solutions give students the opportunity to travel without leaving the classroom. Virtual field trips enable students to see and explore new concepts, cultures, and places on any day of the week without costing the school or parents a fortune. Advancements in technology promise an ever-increasing level of connectivity. For students, this helps erase physical and technological boundaries and opens up educational environments, allowing students to achieve their full potential. To learn more about the ways digital signage improves education, we invite you to download and explore the infographic—Address 10 Education Challenges with Digital Signage.